Haddonfield mother Amy Lackpour is working to make conversations about gun storage a common question for parents sending their kids off on playdates. Haddonfield mom Amy Lackpour explained common sense strategies for keeping children safe in homes with guns on Tuesday, April 18 at Haddonfield Public Library. Lackpour works with “Moms Demand Action” to depoliticize conversations about gun storage and safety. When Amy Lackpour last year heard about two mass shootings in one week in Colorado Springs, Colo., and San Bernardino, Calif., she decided that as a mother to a young child, she needed to find a way to cope with her fears. In her anxious state, Lackpour did some research and stumbled upon “Moms Demand Action for Gun Sense in America” — a nonpartisan, grassroots movement of mothers fighting for public safety measures while still respecting the Second Amendment. 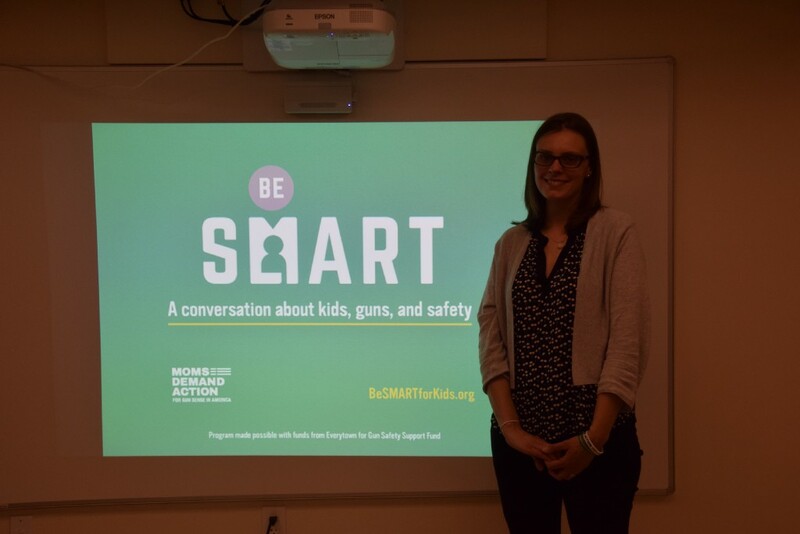 Through Moms, Lackpour, a Haddonfield resident, has been presenting the “Be Smart” program throughout town, which is a public health campaign designed to keep kids safe from unintentional shootings. To date, she has presented at private homes, attended a Haddonfield Progressives’ meeting and even meet with borough commissioners to discuss practical ways to keep children safe in homes where guns are stored. On Tuesday, April 18, Lackpour held a “Be Smart” presentation at Haddonfield Public Library that brought together women with a diverse array of reasons for attending. One audience member said her husband is a police officer, and in the past, she has found her 9-year old snooping around her husband’s gun safe, while another woman in attendance said her brother was murdered with a gun. Lackpour looked at 2015 and 2016 data provided by the Haddonfield Police Department. She found that 116 firearm identification cards and 98 firearm permits were issued to Haddonfield residents in two years. With guns in the Haddonfield population, the question becomes what can parents do to ensure curious kids do not touch their parents’ firearms, Lackpour said. She said parents can drill into their children’s heads not to play with firearms, but if a child’s friend offers to show a parent’s unsecured gun, curiosity could definitely win out. “You can’t rely on kids not to be curious,” Lackpour said. Her “Be SMART” presentation outlined “simple, easy-to-remember behaviors” for parents, with SMART as an acronym for Securing guns in homes and vehicles, Modeling responsible behaviors around guns, Asking about the presence of unsecured guns in other homes, Recognizing the risks of teen suicide, and Telling peers to be SMART. Lackpour said she knows it’s easy to preach these behaviors, but it’s harder to practice them. She said she has felt uncomfortable at times when talking to fellow parents about guns in their home. “When I started doing these presentations, I said to myself, I better start doing this before I go in front of a bunch of people and ask them to do the same thing,” Lackpour said. With a daughter in first grade at J. Fithian Tatem Elementary School, impromptu playdates happen semi-frequently, and she doesn’t know all the parents well yet. Lackpour said whenever one of her daughters asks to have a friend over, she is certain to inform her fellow parents that they have two cats — in case of allergies — and no guns. She said making light of the conversation helps diffuse the awkwardness, but ultimately, she can tell parents appreciate her concern for child safety. When her daughter is headed to other families’ homes, Lackpour said she is sure to ask about guns the home. She said recently when her daughter went to a friend’s house whose father is a police officer, she asked the girl’s mother if there guns in the home, and if so, were they stored properly? While Lackpour had been nervous to ask, she said the conversation was completely pleasant and put her mind at ease. Lackpour said she realizes parents in small towns where everyone knows each other can be deterred from asking for fear of offending their neighbors. However, Lackpour said guns represent a public safety issue, and for that reason, she is trying to foster these open conversations within her community. Lackpour said she has learned many gun owners’ children know where their parents store their firearms. For that reason, she said it is important to put the power to prevent gun violence in parents’ hands. To date, Lackpour has made her presentations in Haddonfield homes to both gun owners and non-gun owners, and she said in doing so, she has encouraged other parents to begin asking these same questions of their neighbors. She said their response has been similar, in that these conversations are often made out to be more intimidating in their heads than they actually end up being. She said her goal moving forward is to continue to speak to local gun owners, so they, too, can help break down the discomfort that comes with talking about gun safety and put fellow parents’ minds at ease when sending their children off to play. Local police officers have been particularly supportive, Lackpour said. Most recently, Lackpour and other Haddonfield members of “Moms” met with borough commissioners to discuss turning Haddonfield orange on June 2 for “National Gun Violence Awareness Day.” Shani Nuckols, a “Moms” member who was in attendance at Tuesday night’s presentation, said the commissioners were receptive to their ideas and offered to turn Borough Hall orange with lights for the day as well as allowing them to decorate downtown with orange ribbons. “It’s a really great way to come together with a lot of great people on this issue,” Nuckols said. Lackpour said she realizes Haddonfield is not a town where there is a high incidence of gun violence, but by honoring National Gun Violence Awareness Day, she and other moms hope to raise awareness. “I believe it’s a great opportunity to show solidarity with other towns and cities in our region that do struggle with higher incidences of violence,” Lackpour said.